Fish populations in Lake Superior and its surrounding fisheries are faring much better than expected a year after a major storm dumped up to 10 inches of rain in the Duluth area and sent tons of sediment rushing into the big lake and its surrounding rivers and streams. Lake Erie's westernmost beach is also among the most entertaining. Beach volleyball? Check. Jet Ski rentals? Check. Sand, surf, concerts and more? Check, check, check, check. Lake Superior anglers near Duluth and Superior may soon be catching a new strain of brown trout. In late May, the Wisconsin Department of Natural Resources stocked about 60,000 Seeforellen-strain brown trout in Lake Superior waters near Superior. The fish were 5 to 6 inches long. ST. CATHARINES - There's nothing like the sight of varnished teak, polished brass and coiled rigging to bring out the pirate in all of us. "Look at me, Mom! Pirates do this all the time!" said four-year-old Liam Semple of Waterloo, hanging from the rigging of the Pride of Baltimore II, during the two-day 1812 St. Catharines Tall Ships visit in Port Dalhousie. "Take a picture," he instructed his mother, Roshan Dore Semple. But no one looked more pirate-ish Sunday than five-year-old Wolf Phelps of Fort Erie, who used the occasion of the visit of the Pride of Baltimore, Unicorn and Lynx to don full pirate garb, including boots, hat, dreadlocks, and painted-by-mom goatee and mustache. 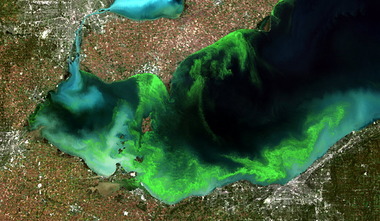 Lake Erie will be in full bloom from the middle of August to early October.